Meet & greet service for private transport between Faro Airport and your final destination in Vila Real de St. Antonio. Exclusive arrival & departure airport transfers on quality taxis, minibuses and coaches with friendly drivers at the best prices. Easy online booking with immediate confirmation and no sign-in required. Vila Real de St. Antonio is one of the eight municipalities in the Eastern Algarve area. It is subdivided into several civil parishes including Vila Real de St. Antonio itself that stays about 67 Km from Faro Airport. Transfer time takes approximately 50 min, depending on the exact location of your hotel in Vila Real de St. Antonio and traffic conditions. 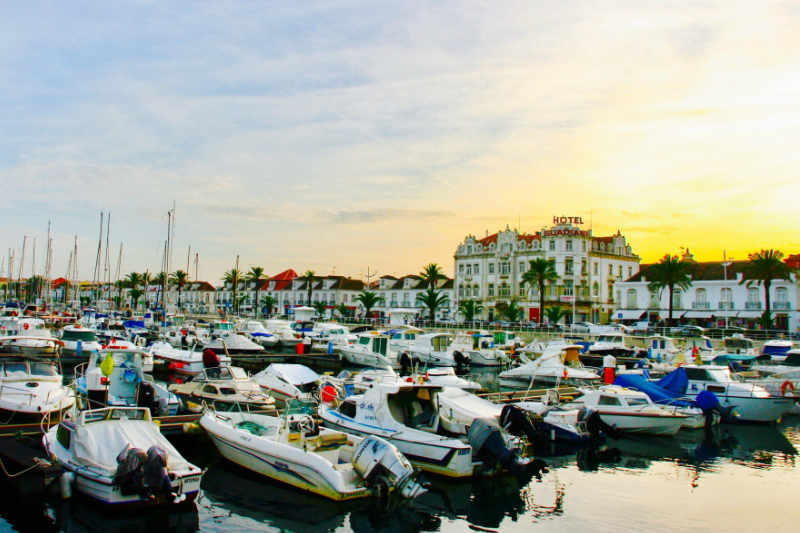 This page provides insightful information and prices regarding the two most common transport options from Faro Airport to Vila Real de St. Antonio, so you know what to expect upon your arrival at Faro Airport and to help you decide between a regular public taxi or a private airport transfer to Vila Real de St. Antonio. Algarve map with the location of Vila Real de St. Antonio inside its municipality area - approximately 67 Km from Faro airport. Travelling to the Algarve soon and searching for ground transportation from Faro Airport straight to your holiday accommodation in Vila Real de St. Antonio? Because there are no train nor public bus connections from Faro Airport to Vila Real de St. Antonio - only possible from Faro city centre, 8 Km away from the airport - basically you have two options: arrange for a private taxi transfer to Vila Real de St. Antonio or take a regular public taxi to Vila Real de St. Antonio. The first needs to pre-booked online prior to your arrival while the second doesn't but is subject to availability upon your arrival and implies waiting time at the airport taxi rank. Public taxi prices represent an estimate of the final total value. Private taxi transfer prices are fixed for any given address in Vila Real de St. Antonio. In general, the private transfer prices are considerably lower than public taxis and you get a more personalized, faster and hassle free transport alternative to Vila Real de St. Antonio - meet & greet service with fixed rates for the entire Vila Real de St. Antonio area regardless of the exact address of your hotel or journey duration. For a more in-depth comparison between public and private taxis between Faro airport and Vila Real de St. Antonio, highlighting side-by-side the main differences between each service, please refer to the private vs. public taxis comparison table. Standard public taxis at Faro Airport, as in the rest of Portugal apply variable fares based on travelled kilometres and taxi idle time. The rate also varies according to the time of day and taxi passenger capacity. For this reason the price of a public taxi from Faro Airport to Vila Real de St. Antonio shown on this page is an estimate of the final total cost, as it may vary depending on the exact address of your hotel in Vila Real de St. Antonio and traffic conditions. The following table gives you an idea of the charges applied and an estimate for the total cost should you decide to take a cab between Faro Airport and Vila Real de St. Antonio. The above taxi fares to Vila Real de St. Antonio increase by 20% on nightime services between 9PM and 6AM, on weekends and holidays. Bigger sized public taxis up to 8 passengers are not as frequent as the 4 passenger taxis. So if your travel group is over 4 persons you might end up having to take two separate cabs and pay twice the value to get everyone to Vila Real de St. Antonio. Forget struggling with luggage and the heat in the waiting lines of Faro Airport taxi rank. There's a faster, more comfortable and yet very affordable transport alternative: online booking of private taxi transfers from Faro Airport to Vila Real de St. Antonio. Meet & greet service carried out by professional drivers on a range of quality, modern transfer vehicles ready for different group sizes and luggage requirements - sedans, vans, minibuses and coaches. Reliable and economical hotel transfers, transport to private villas or any given address in Vila Real de St. Antonio that will you save you money and precious holiday time in the Algarve. See the section how it works for more service details. We will be very pleased to welcome you at Faro Airport. Private transfers to Vila Real de St. Antonio - the best value for money option! Within the Vila Real de St. Antonio municipality there are other known locations where your accommodation might be located.